Hello, How is one handed operation ? ie. changing levels ? Is it as easy as the Haiku ? Thanks.. It takes some torque to overcome the resistance of the two O-rings. I suspect these lights will break in nicely with use but as for one handed operation I would state it can be a challenge. With the backlash present in any twisty light, you can "cheat" by twisting the light on and then just backing off until it turns off. At that point you can put a side load on the head (or pull it back) for a momentary on and then off and back on again for a level shift and repeat until you get the level you want. At that point you can twist it on. This can be done one handed but not that easily. I would categorize the Aqua as a two handed light for activation and level changing. The newest ones don't seem to offer a button top. Does your design require a button top cell? Is a 2200mAH 18650 all we need? Or would something like a 2900mAH 18650 be better? Well more the capacity the better the runtime. 2200 will be fine. Sitting here tonite with my Haiku AA, I should have ordered my AquaRam with a tapped clip for tripod mount. If someone could post outdoor beamshots to give an idea of the beam pattern and throw that would be very much appreciated. Also, will 550 paracord fit through the holes in the tail? Last edited by mattp; 10-20-2013 at 04:55 AM. Subscribed. I've been anxiously waiting for a Ti 27LT to come up for sale after owning the Al. Version. I haven't seen this asked or answered, can either light be converted to the other? The head, window, o-rings, MCPCB, and converter are the same for either light but converting from one to the other would require a complete head disassembly and then rebuild with the right components. It's something I can do since I have all of the components but it's not something the user could do. Today i want to shed some more light on the „smart“ features of the HiveLD driver that are working in the background - the battery voltage and temperature monitoring. This serves both as an over discharge protection for unprotected Li-Ion rechargeables as well as a safety feature to prevent a complete shutdown of the light when using protected Li-Ion cells when their own protection cuts off the cell. The driver reduces the output stepwise before these critical low cell voltage levels are reached. Because it steps down through the output levels depending on the cell voltage, you can even tell by the amount of reduction whether the cell still has a some runtime left or is rather close to being empty. For the stock configuration of 4 output levels this means that the driver will step down from level 4 (1400 mA) to 3 (515 mA), then 2, 1 and after that to the lowest possible output (approx. 7 mA). To illustrate what this looks like in reality, below is a discharge plot of a 2000 mAh cell, showing cell voltage and LED current. 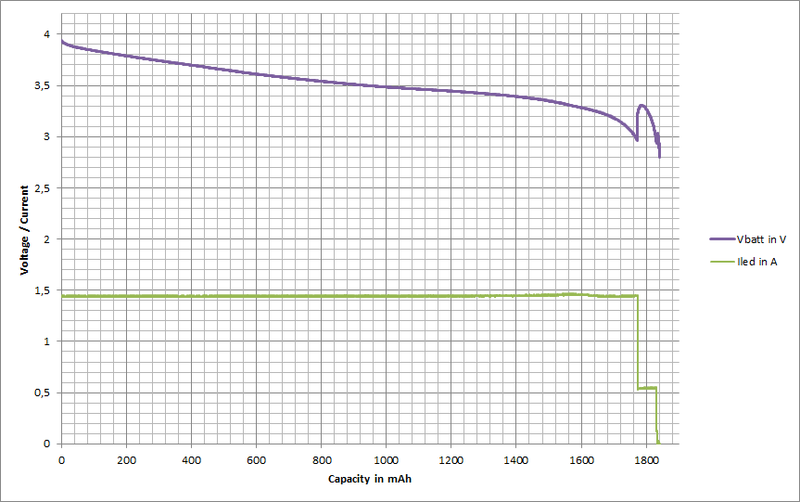 Using the same data, when plotted vs. the cell capacity you can see that the first step of the output reduction happens after more than 90% discharge of the cell. In runtime however this still means more than an hour of light at a lower brightness. 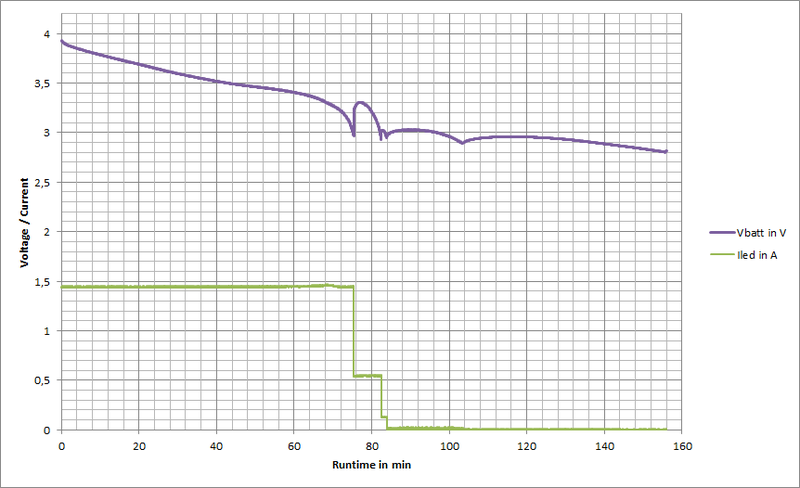 Mind you that this example shows a constant discharge on a high level, when discharging on a lower current or by intermittent use, the remaining runtime after the first output reduction will be shorter. It will still give you a good amount of time until the cell is completely empty though. The driver measures the temperature on its own PCB and reduces the output when the configured threshold value is reached. This should rarely happen in the stock configuration with a maximum output current of 1400 mA, except for when the light is sitting still on a surface that doesn’t conduct heat very well. Unlike the low voltage reduction, the output is not reduced to the next lower programmed output level but to the next lower brightness level, i. e. from brightness level 21 (1400 mA in the stock configuration) to level 20 (approx. 1130 mA). Once the light has cooled down, the output is increased again to brightness level 21 for this example. To avoid that this keeps going back and forth many times, the output will stay down in brightness level 20 after 3 repetitions. The threshold temperature is set to 60°C in v1.0 of the firmware, but we plan to reduce this default to 50°C for the next drivers to be programmed. Since there is no direct thermal path to the LED or the head, the outside temperature of the head is actually higher when the driver board would reach 60°C. I have measured about 75°C for the AquaRam and about 85°C more for the AquaMule when the reduction takes place. Sounds great Martin! Mine should arrive tomorrow. Just checked the tracking. Mine are coming today, too! I am getting my AquaRam, a Nailbender Copper Mule 4 mode CRI XML and a Vin Vostro must have #2. Today is a banner day!!! Also a Ramen Noodle day! You are a pro at sticking to the newest of the best. This is an exciting venture to see unfold to us all at a much greater scale than just a select few. Nice, Brandon! I'm getting an AquaRam and an AquaMule today. Haven't been this excited since Data introduced Spy 007 Run #1! Seriously, this is the most exciting McGizmo offering in years, IMO! Trouble is they seem so 'modable' too. I'm already dreaming of a 'McGizmo Terra / Aqua Light' with a clicky pack and Tain style micro knurling on the flats of the body !!! Your item was processed through our P&DC HONOLULU HI 968 (USPS) facility on October 18, 2013 at 12:21 am. The item is currently in transit to the destination. We are all flotsam and jetsam being carried by a relentless tide towards our ultimate fate! Troy, agreed. This is one heck of an offering! McGizmo Ti Tank. I have also been queried already if a clickie pak is possible. Yes, a clickie pak is possible as would be a PD style pak. However at this point in time I have no definite plans to go further with this new platform beyond what is being offered here. I can't say what the future might bring. [gearcarrot.com] Collector and distributor of (mis)information. OH......MY.......GARSH (toned down because, supposedly, this is a "family" forum, lol)...JUST RECEIVED MY AQUA LIGHTS (AND, YES, I'M IN ALL CAPS BECAUSE I REALLY AM YELLING)....I FLARKING LOVE THEM! THEY'RE FLOPPIN' AMAZING!!!!! THE MULE, ESPECIALLY!!!! WILL BE SNAGGING EVEN MORE OF THESE BECAUSE I'M IN LOVE. I'll echo what Troy has already said. This is a MANS light. I mean it is beefy. It is bold. It makes a presence in the room. The beam has a nice mixture of flood and throw. I can't wait to dive into the programming. Gonna bump high to 2200mA. The tint seems to be pure white. No blue or green whatsoever. Maybe a hint of vanilla in the corona on a white wall. It is really great owning this light as I was a huge fan of the 27LT. Feels great in hand. I can definitely see myself getting a AquaMule and having it modded to CRI XM-L2. I REALLY like that emitter. Very happy to hear the positive reports coming in. I think Don has really come full circle with this light. If I recall correctly, the 27LT was one of the very last aluminum offerings and the one that wasn't offered in titanium until now. I really loved my 27LTs but let them go for one reason - the UX1K emitter was too green for my liking. I was so happy to see the the Aqua series photos on his page. Beautifully designed, yet with the simplicity of a twisty. Troy - I agree, I haven't been this excited about a light since my purchase of the first run Spy007 titanium, which I still have today. I'm really looking forward to receiving my lights tomorrow (I ordered one of each), but there's just one problem....I don't have any 18650's. Me and Troy (AWTYD) have been texting back and forth for the past 45 min or so just raving about the Aqua series. He has convinced me I need a AquaMule. So I gotta sell some stuff in the next few weeks. Nice chatting with ya Troy! I've been toying with grabbing one of these, however, I was wondering if Don expects to have these lights available for a while? I will be in Maui in Jan 2014. Like my Haiku, it would be cool to pick it up in person. That would also give me time to locate a battery. AW is a 6 week mailing, and not sure if these are available locally. I'm also wondering what the run will be on these lights. I'm a hair away from ordering the mule. I'd like to hear more about the beam. I have a Haiku XML - is the color rendition of the Aqua XML-2 similar? How cool would you say it is? Much appreciated. And Troy, also feel free I weigh in here as well. ...and He separated the light from darkness. Check out my lights. Colour, to my eyes is very similar to the Haiku XML, just pure white, no hint of blue. The Mule bean angle is the widest I've seen on any light other than a bare led lantern.